You need to be a member of Bloodlock War to add comments! 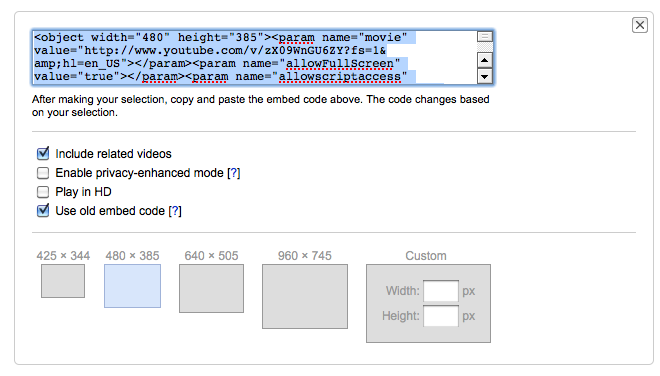 First, you need to find an online video that gives you an "embed" code. If you are looking at YouTube, you will find the Embed Code button directly under the video; click on the Embed button and the code will be displayed in a text box where you can cut and paste it. Now, go to your Bloodlock post and position the cursor where you want to insert the video. Then, click on theVideo icon. A text box will pop up where you can paste the embed code. Click OK when you are done. Since embedded video is always linked back to its original source, you do not have to provide vide information, but it's a good idea to include a link to the YouTube webpage, just in case people are having trouble seeing the embedded video. TIP: If your video is not displaying correctly, try choosing the "old code" method of embedding, which you can access at YouTube in the options box - here's a screenshot of what that looks like. There are other options you can configure, too! If you are not sure whether your video is playing correctly or not, just send me an email with a link to the post that contains your video, and I'll be glad to check it for you. The video play depends on the Flash settings on a computer, and that can get complicated sometimes!